Just got back from a holiday on the beautiful Isle of Mull (post to follow) to be greeted by a gorgeous heap of colour in the front garden. Finally, after many dry weeks, we’ve had some rain while we’ve been away and the Tulips have really started to perform. I was hoping to get an overall orangey look, broken up by the purple of the Burgundy Tulip, but like all good experiments, it’s not quite come to fruition as I’d imagined! The in-your-face red and yellow Helmars are a triumph. I love their rounded cup shape and their surreal colouring is truly spectacular. 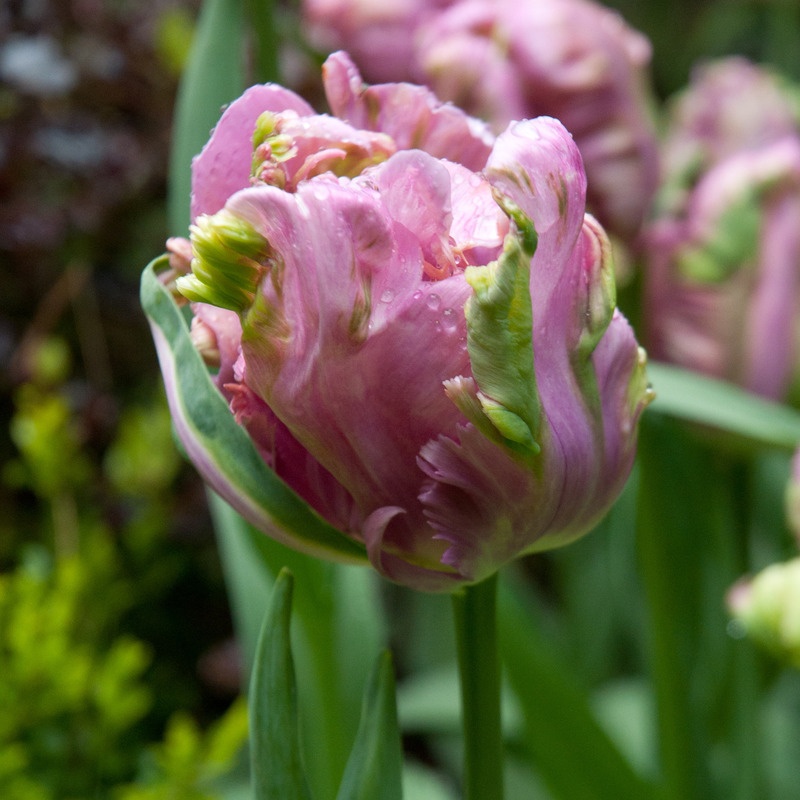 However my much-lusted-after Irene Parrot Tulips are a real disappointment. Literally, they’ve come up short, prompting a friend to ask if I’d invested in some dwarf varieties this year! I’ve never grown Parrots before, and I’m wondering if the lack of rain has affected this variety more than the others in the bed. Yes, they have all the crinkly gorgeousness that I’d dreamed off, but they’re now none too visible owing to their unforeseen lack of stature. 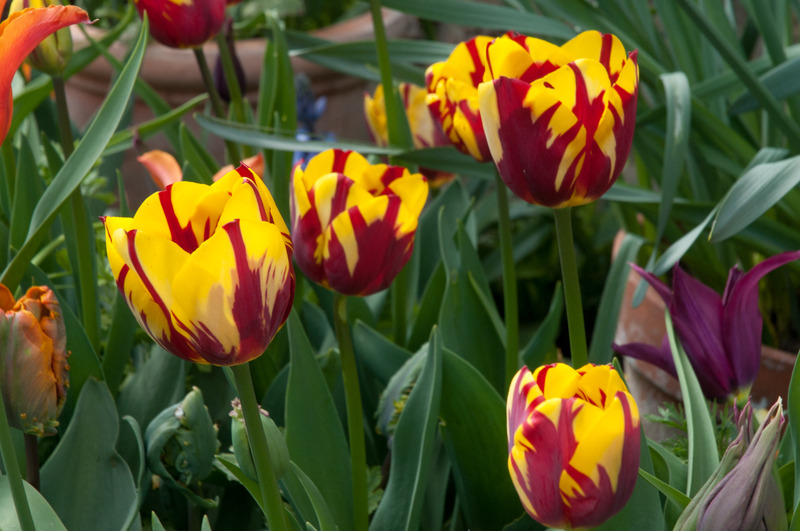 At three times the price of many other Tulip bulbs, sadly, they’ll not be on my must-have list again next year. 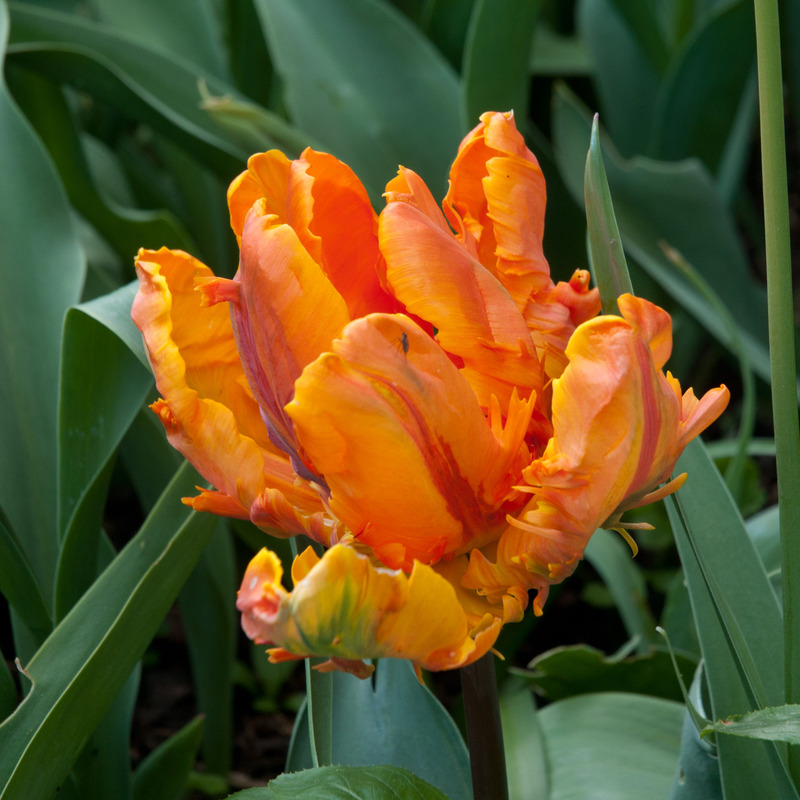 Luckily, previously planted orange Ballerina tulips have returned in enough number to fill in for the Parrots, and this reliable Lily flowered Tulip will be a variety that I’ll be using again and again. The hoped-for sobering force of the Burgundy Tulip hasn’t quite come off either, as these are a little behind the other buds in flowering, and dare I say, a little on the short side too. However, things may change in the next few days. Here’s hoping! Further experimentation is ongoing too, around the corner, on a busy stretch of road. 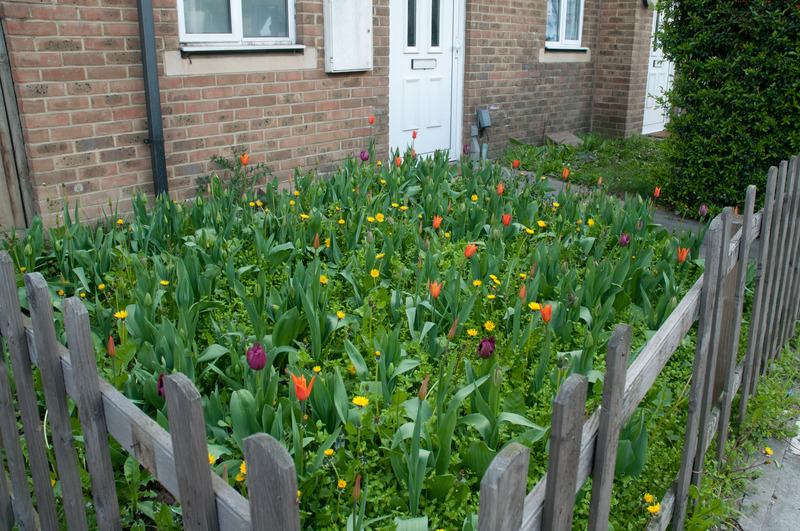 Our community project planted a few hundred bulbs in this overgrown front garden, hoping to inject some colour into this temptingly empty forgotten corner. 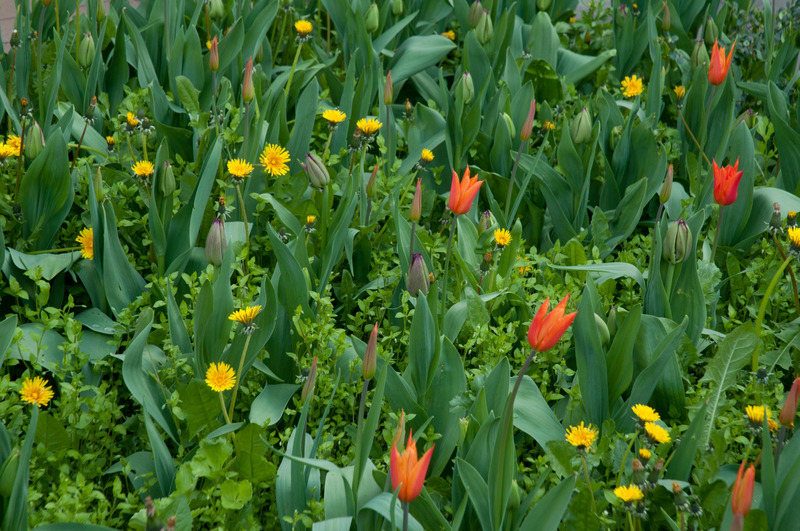 Only having the opportunity for a quick weed at the time of planting has allowed plenty of dandelions to return, but at the moment, these wildflowers look fantastic amongst the emerging orange Ballerina and deep pink Curly Sue Tulips. Looking forward to returning in a few days to see how this front garden progresses too. 12 days later, tons of rain and the odd bit of sun have really brought these Tulips on. 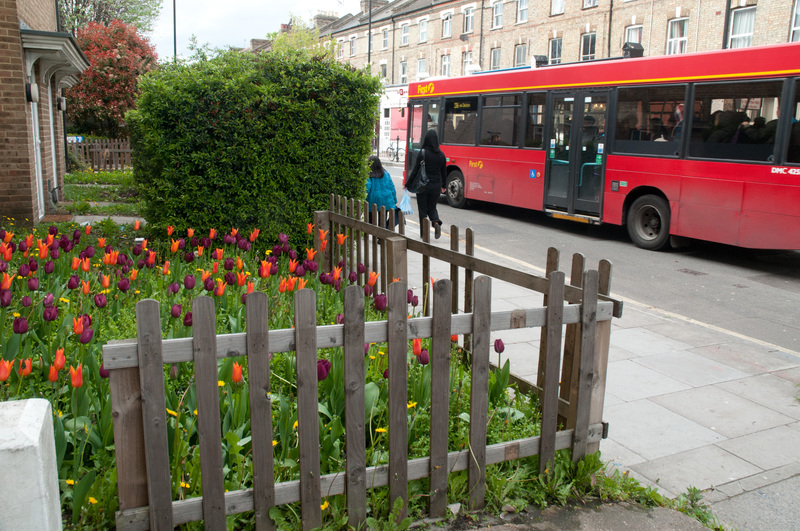 The resident loves his garden and hopefully the sumptuous colours will brighten the day for those who pass by on this busy main road. p.s. All Tulip bulbs ordered from Peter Nyssen last October and planted in November. OK, I know I said never again, but since a few days ago, I’ve caught up with a few more Tulips, and I may have changed my mind! I had to agree with a client that this Tulipa Rai is gorgeous and looks great as a cut flower too. I also read a very timely article by Jane Perrone in The Guardian today which confirmed that I am not alone in suffering from stumpy Tulips. Many others have been complaining of such a fate and this is due to lack of water during the dry spell we had about a month or so ago. I also think my clients have been a litle more vigilant with watering than I have, and their blooms are subsequently a tad taller. Along with the white Super Parrot, I think you’d agree that this Bastogne Parrot (above) is rather scrumptuous, dare I say, almost edible. And so now I’m asking myself, how could I not grow these chewy delights next year? Now that’s what I call a display and I love the combination with the picket fence. Thanks Sue. Hoping to plant up some wildflowers in this picket fenced garden later in the year too. Seems a waste not to! They do look wonderful, I don’t think I’ve seen a bed full of just tulips before. Do you leave the bulbs in for next year? What a welcome home! 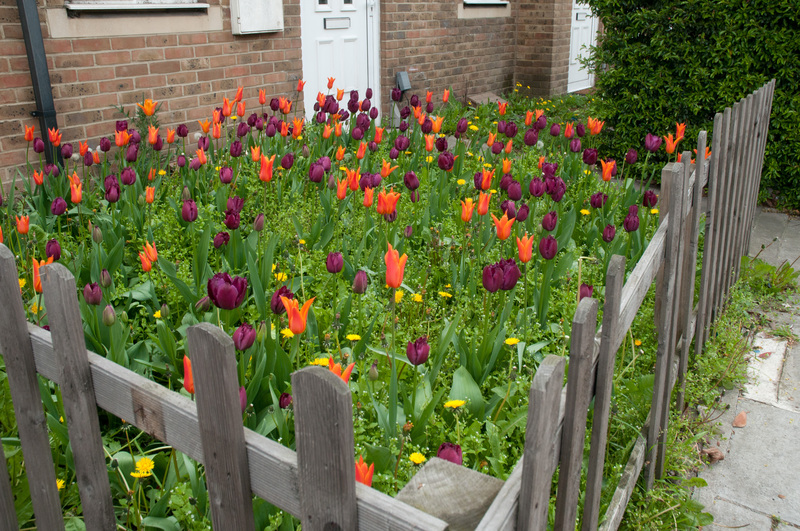 It looks like there are a lot more tulips still to come out in that little corner plot too. Hi Liz, I did experiment with leaving bulbs in couple of years ago, but only had a few bulbs which came back. 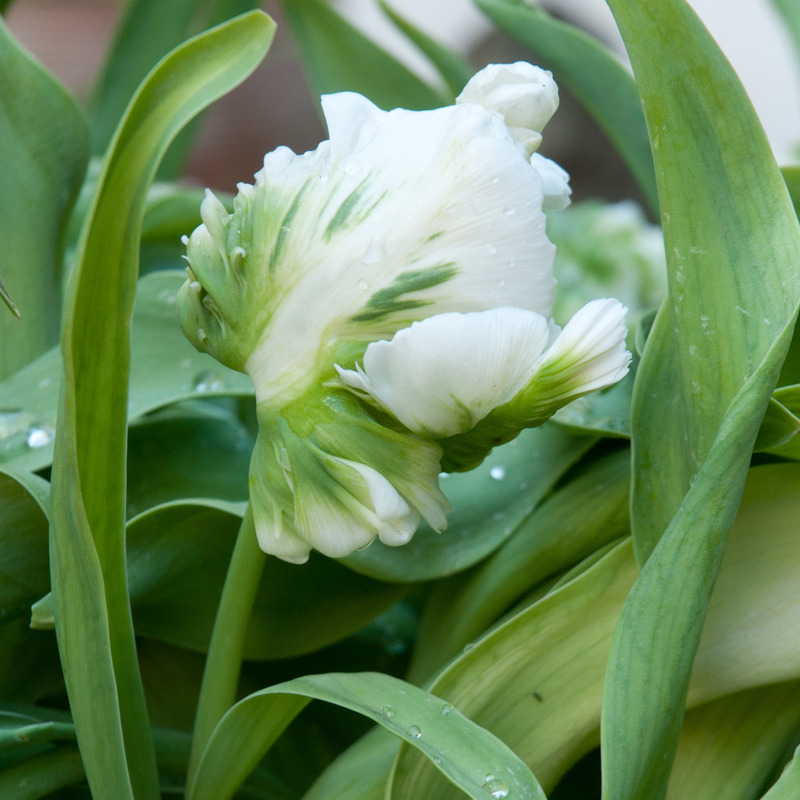 The surviving few are the Ballerina tulips which saved the day in the bed this year. Think our heavy clay soil is just too cold and wet in winter for them, even though I originally planted (painstakingly) with grit underneath each bulb for better drainage. 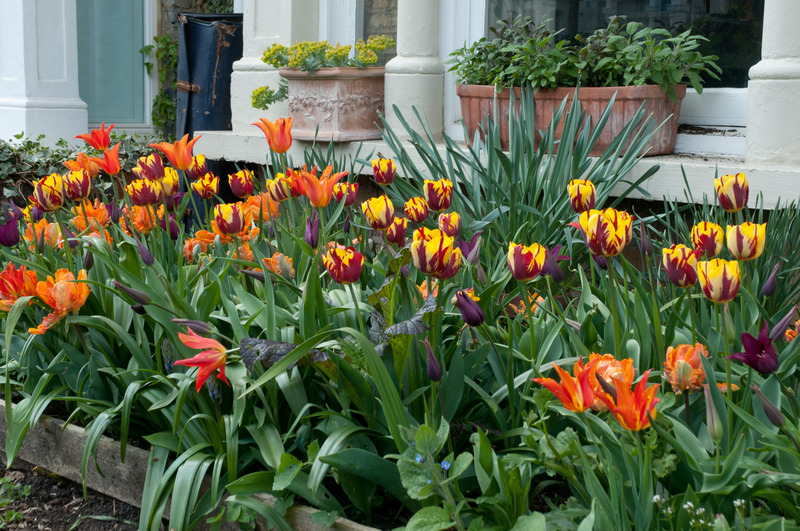 Now think of Tulips more as an annual treat, rather than a perennial bulb. Helen-yes, looking forward to more action in the corner plot. Will update post when there’s more to see! They’re lovely! I especially like the burgundy against the orange ones. What a nice surprise for your return home! 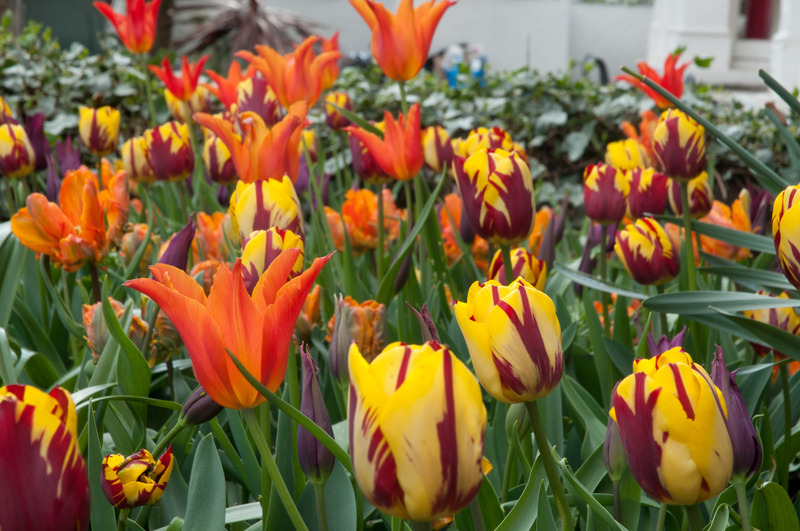 Hi Jane and PJ Girl, Wouldn’t be without Tulips in spring-always blown away with their jewel like qualities and great fun to experiment with new combinations each year. Quite a few of my tulips have come up, literally, a bit short. I think the dry weather as they were growing has had something to do with it. 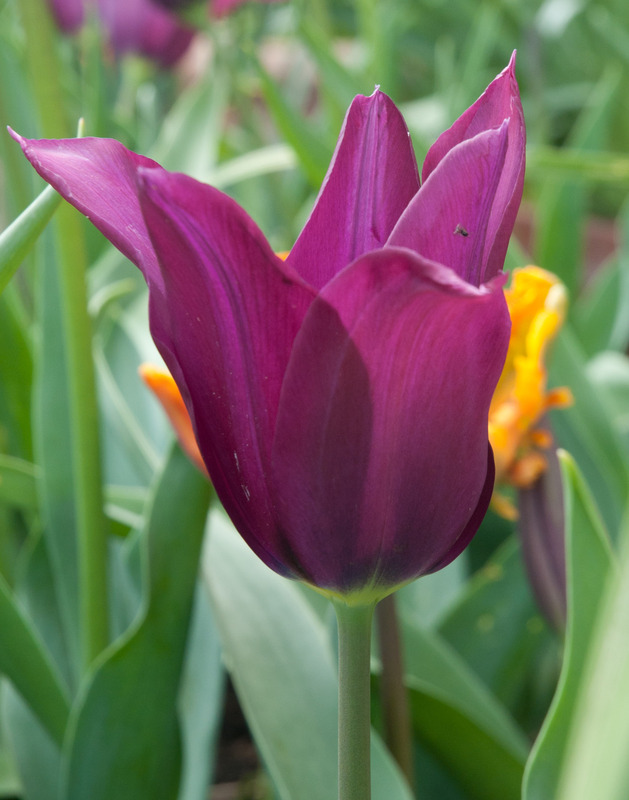 I do love Ballerina tulips, I love to combine them with Queen of the Night, it makes a stunning combination. Hi Amoogk, yes, some varieties not coping so well with the dry weather. Might give Peter Nyssen a call just to get their opinion on the matter too. Ballerina with Queen of the night sounds like a sumptuous combination. Have planted Ballerina with Curly Sue (above in corner garden) and looking forward to seeing how they come together soon. What a shame about the parrots – but the Ballerinas look fantastic – actually it all looks pretty incredible, what a treat to return to! H Charlotte, Yes, I think I’ll be ordering lovely fringed Tulips next year and not parrots. Have used parrots in a few gardens this spring and they’re also prone to flop in the rain (it did pour today-finally!). However, don’t want to moan too much-was a delicious sight to behold on our return. 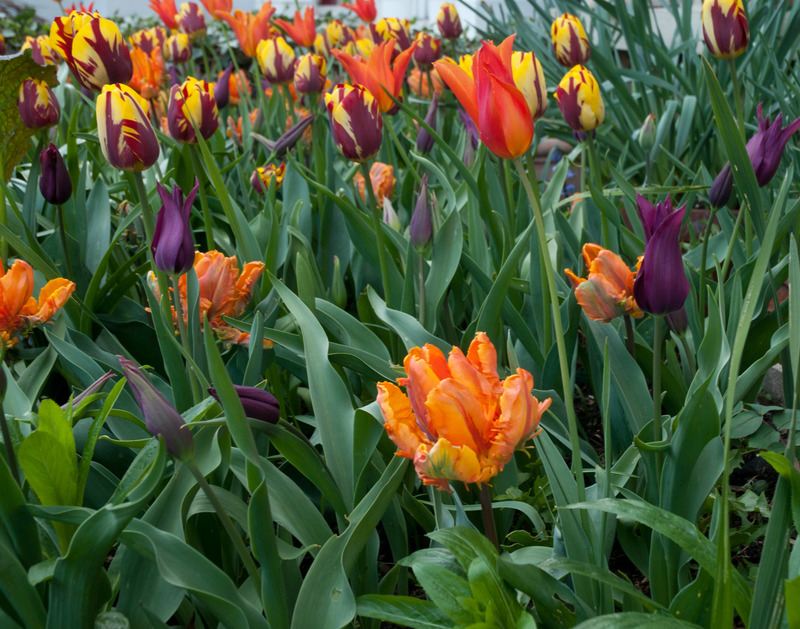 Just rechecked the name of your lovely orange tulips – the Ballerina – after they got a mention on BBC Chelsea coverage by Andy Sturgeon as being good in sandy soil. 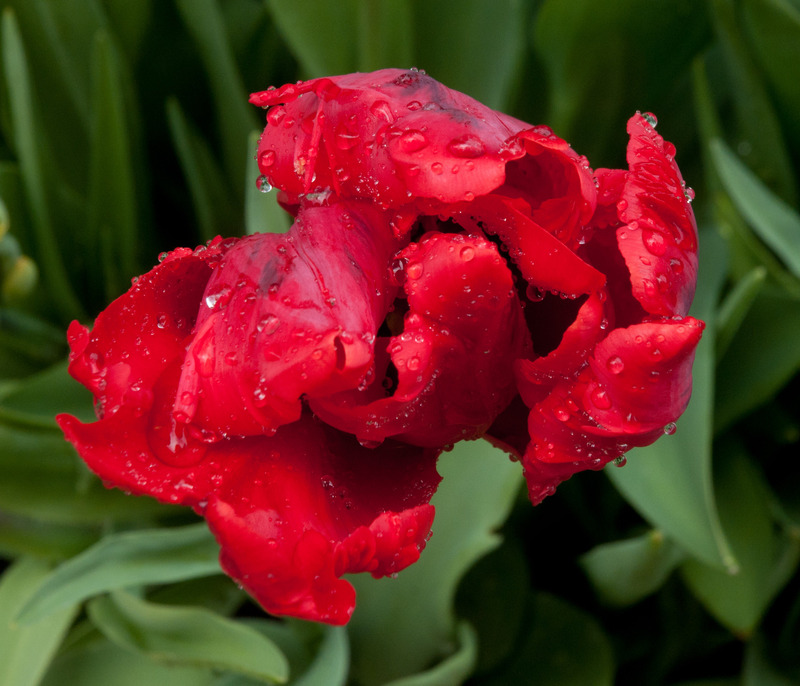 By the way I had a beautiful pot of red parrot tulips this year – £3 from Sainsbury’s – I think for 10. They aren’t tall, but in a pot on their own with small maroon pansies and cool weather they were a delight for weeks. 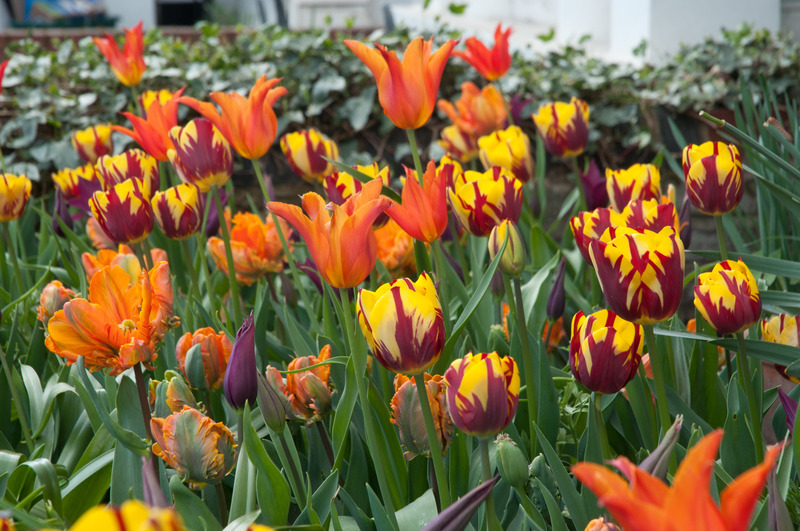 Hi Jo, yes, this cool =weather was great for a long flowering season for Tulips. Your combination sounds great.Love that contrast of colours.